The reputation of oil palm business group Sawit Sumbermas Sarana (SSS), a holding of one of Indonesia’s richest men, has in recent days taken hits on multiple fronts, with a pair of NGOs separately accusing the firm of violating various sustainability commitments it is party to. The criticism highlights holes in both the Indonesia Palm Oil Pledge (IPOP), a high-profile sustainability pact to which palm giants Wilmar, Golden Agri-Resources (GAR), Musim Mas, Asian Agri and Cargill as well as the Indonesian Chamber of Commerce (Kadin) are signatories, and the Roundtable on Sustainable Palm Oil (RSPO), an eco-certification initiative that requires companies to abide by certain social and environmental criteria when opening up new lands for plantations. Last week, Greenomics-Indonesia said in a report that an SSS subsidiary named Kalimantan Sawit Abadi (KSA) was clearing forested peatlands and orangutan habitat in Central Kalimantan province, in breach of no-deforestation commitments by its customers Wilmar, GAR, Musim Mas and Asian Agri, all of which have pledged individually as well as through the IPOP to purge their supply chains of deforestation. Satellite imagery from Greenomics-Indonesia’s report on Sawit Sumbermas Sarana’s forest destruction in Central Kalimantan. Then this week, UK-based NGO the Environmental Investigation Agency (EIA) lodged a formal grievance with the RSPO about a different SSS subsidiary. The complaint accuses Sawit Mandiri Lestari (SML), another developer in Central Kalimantan, of failing to consult communities with a stake in the land it meant to clear and failing to properly identify high-conservation value (HCV) lands for set-aside purposes, as required by the RSPO, a voluntary standard which SSS has chosen to join. Neither had SML properly completed its legally mandated Environmental Impact Assessment (AMDAL) or obtained several required government permits, according to the EIA. “This is unfortunately yet another case of a palm oil company riding roughshod over regulations and the rights of indigenous people in the area concerned and resorting to a variety of dirty tricks to do it,” EIA forest campaigner Tomasz Johnson said in a statement. SSS did not respond to multiple requests for comment. RSPO spokesman Stefano Savi told Mongabay that the RSPO would review the documents and meet with the EIA and SSS to encourage them to resolve the dispute on their own, as per RSPO procedure. Failing that, the case is tentatively scheduled to come before the RSPO’s complaints panel on July 29. Wilmar said that following an earlier Greenomics report on SSS, it had suspended its dealings with the company pending the latter’s completion of a high-carbon stock (HCS) assessment, after which Wilmar had “reinstated buying, albeit in small quantities.” (The term “HCS” generally refers to any forest more robust than shrubland and marks the IPOP companies’ cut-off point for “deforestation.”) The spokesman did not address Greenomics’ finding that the supplier had continued to clear HCS forest through at least May 13, the date of the most recent satellite imagery provided in the report. Musim Mas said it had not sourced SSS “for the whole year of 2015.” Asian Agri did not respond to a request for comment. Kadin’s Dharsono Hartono said the relevant IPOP companies “have engaged or are engaging [SSS] on a one to one basis” in order to bring it in line with their commitments. The Forest Trust (TFT), a nonprofit that helps companies run responsible supply chains and which last month suspended its cooperation with GAR’s plantation arm because of frequent policy breaches, said in vague terms that it was “actively engaging” its partners “to discuss these findings” and would issue a full update by June 17. “It would appear that IPOP is devoid of monitoring and protocols,” Greenomics added. The EIA pointed to similar deficiencies with the RSPO. Since the beginning of 2010, when the RSPO’s New Planting Procedure (NPP) took effect, all new land clearing has had to be preceded by an HCV assessment and a social and environmental impact assessment (SEIA) by RSPO-approved assessors. In its NPP submission, SML’s auditor, Sonokeling Akreditas Nusantara, described a series of consultations it said took place with affected communities in the form of both “in-depth interviews” and focus-group discussions. When the EIA and its local partner, the Independent Forest Monitoring Network (JPIK), visited the communities, however, they found that Sonokeling had either mischaracterized the nature of the consultations or that they had not taken place at all. SSS was founded by Abdul Rasyid, listed by Forbes magazine last year as Indonesia’s 41st richest person. Much of his $805 million fortune is said to have been built on widespread illegal logging. 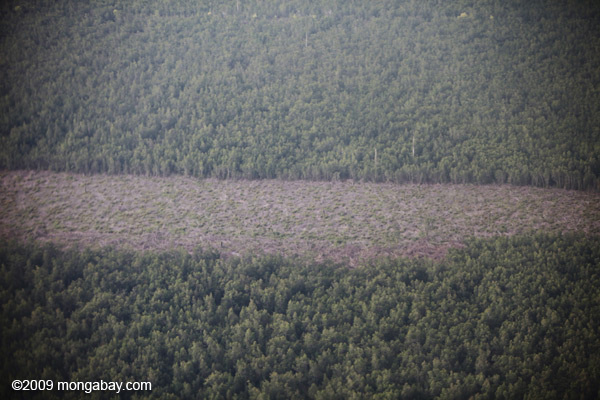 No Comments to "Oil Palm Company Accused of Violating RSPO, IPOP Standards in Indonesia"